This entry was posted on Saturday, September 8th, 2012 at 5:56 am	and is filed under Eco-living, Ideas we ♥, Make a difference. You can follow any responses to this entry through the RSS 2.0 feed. You can leave a response, or trackback from your own site. really a needy initiative by you , you have my full support !! Thanks Aakansh..Do spread the word . This is a message that we need to share across India . You can make a strong contribution by printing the poster and sharing in your office / residential building/school/ college notice board . Administrative has to do something. It is not the “Indian 1″ or “Indian 2″ or whomsoever is fault. I had been to India recently. Had a banana from roadside but could not find any bin to throw it. Had to carry Banana peel for close to 1 hr before could dispose it in bus stand. 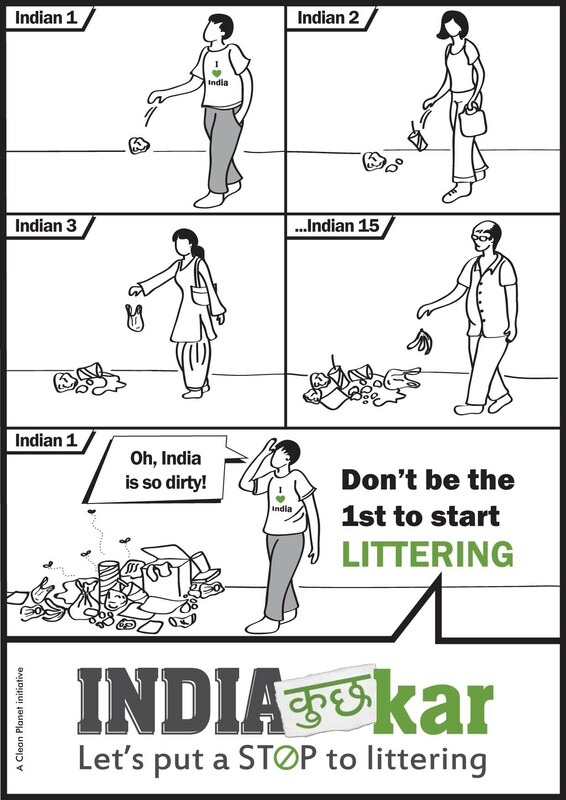 In our country we have bin every 10 to 15 meters so we do not have such issues. Really appreciable!!!! you have full support:) will try to share as much as possible…. This need to spread nation wide. We all think that all road, buses, train and public places are owned by our forefathers and we can treat them the way we want and still we forget that this is not the way we keep our home which is actually owned by our fathers.lets not keep this intiative only on the social netwoking portal lets make it a nation wide movement. Thanks Priyanka..you’re absolutely right . We don’t treat public spaces with a fraction of the respect we have for our homes. we can change india awaring countrymen not to do this type of activity which they can’t repair. Khup Chan Ahe . Pratyekane aplya Sarvajanik Ganapati chya thikani lau ya. Me Amchya ehte Building Madhe 3 wings ani Charkop Ganpati Mandal ethe aaj Laven. Atleast we have try to do smthng,For our green & clean planet. well done!!! my best wishes & support!!! I second your thoughts. I have been propagating this initiative among my friends for a very long time. I sincerely hope your initiative reaches mass awareness. I support you wholeheartedly. I am in. Just like to add, I visited Gujarat recently and found a massive improvement. But most part of India remains the same. Well done for starting the campaign. Hey Hasmukh..it’s good to hear about the improvement you noticed in Gujarat . It’s proof that change is possible . I was waiting outside a shop when I saw this young boy, maybe 3, standing with his mother,merrily sipping away from a juice tetrapack.The moment it was empty, he just flung it onto the floor. I waited for his mother to react but when she didnt, I sternly told the kid to pick it up and bin it. His jaw dropped…he had probably never been told to do what I had just asked him to do. He kept staring at me and I stared back till his mother sheepishly propelled him towards the carton. At which point, I walked away, hoping a lesson had been learnt! I thought of doing something like a competition back in college. The goal would be to clean the city inviting all the nearby colleges. Competition would attract people and sponsors and publicity. In the end a good message like we did this much in a day, the rest is upto you. Instead of complaining start doing something. Anything would be nice to begin with. Mail me if you are upto something. I am totally interested. sirf baate krne se ku6 nhi hoga.quick action for cleaning walls around colleges,schools, & Resi.Areas. in baroda.